After taking a weekend off to get in some hiking, see a Blue Angels airshow, and let the bayou settle down a bit, it was time to get back out there for another fun expedition. The bayou did not disappoint. 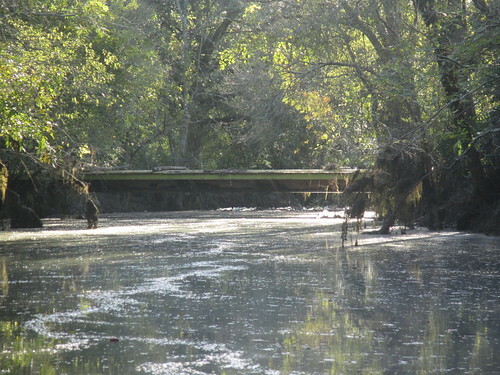 With rainfall records falling left and right, the waterways around Baton Rouge have not lacked for navigability of late. We’ve taken advantage of the high water to gain access to several latent problem areas, but with them mostly dealt with, we’ve actually been wishing for perhaps just a bit less water around. With a bit of a dry respite, Bayou Fountain finally dropped down low enough to duck under Rackley Bridge, so on the bayou we were. Heading downstream, there were surprisingly few problems given the epic amounts of water that have been down (and at times up) the bayou. There was the standard large accumulation of things that builds up when the water is into the side of the bridge for an extended period of time, but that still had a decent path around. For the most part, the upper half of Bayou Fountain was generally unimpeded, except for a few places. Less than a mile down, just beyond the stub on the north bank of the bayou, a long-fallen tree trunk had floated down and blocked the bayou. 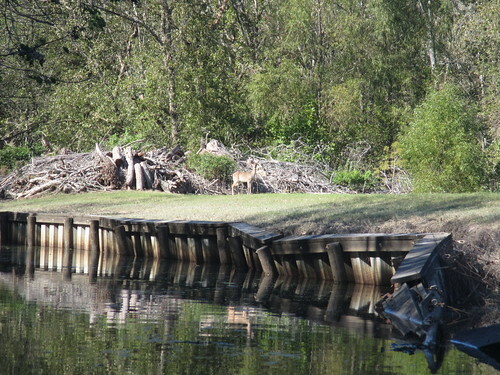 It took a bit of sawing, but eventually it gave in and became just more logs floating along downstream. After that, it was on to the fallen tree we half-worked the previous trip. This time the water was low enough to reach the rest of it, one piece at a time, until only the remains of the trunk remained. Of course, it had been in the water for a while, and the underwater limbs had apparently been occupied by some of our local fauna. When I noticed movement in the bottom of the canoe, I had to grab for the camera. 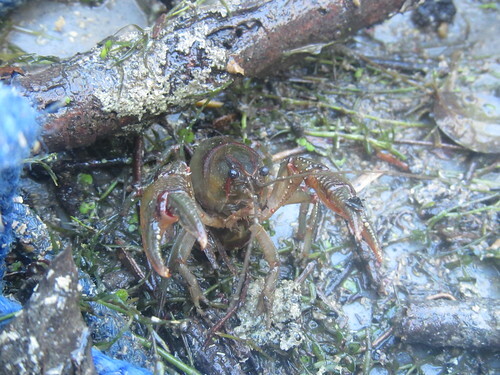 The little guy was nice enough to pose before I helped him back to the water. 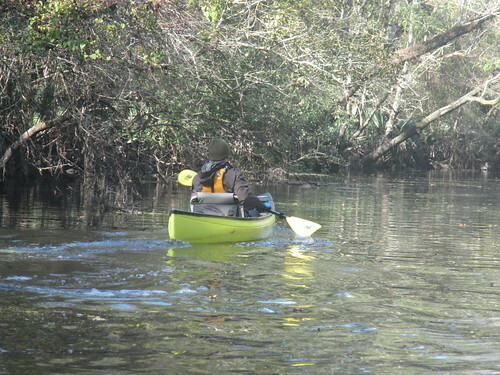 I was just finishing up when back up from Bayou Manchac came a solo canoe. He had put in at Highland Road Park and paddled all the way to Bayou Manchac. We talked a bit about BREC’s plans for paddle launches, PaddleBR’s work on the bayou, and how great it is to paddle in the cooler weather. The we each headed off in the direction from which the other had just come. The lower half of the paddle trail, from about the two mile mark (or larger powerline crossing) down, was still mostly underwater. 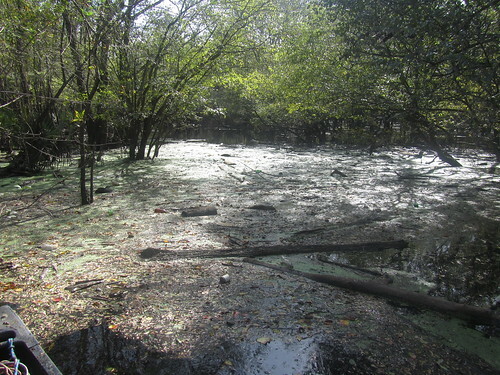 The current picked up just a bit, too, from water slowly draining out of all the surrounding bottomland forest. For it to still be so high, we figured that it must have been epic at its peak, and when I saw the water lines on the 1-1/2 mile marker, that certainly confirmed it. The water had reached over halfway up the sign! 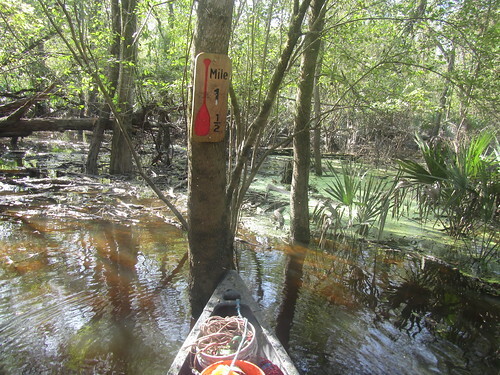 Crossing paths with a canoe that had already been to Bayou Manchac turned out to be quite convenient, as he gave me a heads up on the conditions to expect the rest of the way. It was pretty much as expected: some catches, mostly branchy. In general, those are not too difficult to simply paddle over. They’ll slow you down, and you may hear a thunk or few as you hit logs, but they’re not logjams. They will become logjams if you leave them alone, of course. There were a few to deal with, but most of them only needed a few bits of branchy debris dispatched to have the bayou flowing unimpeded. One, however, had a bit more going for it in the logs-and-limbs area — which was just what I was looking for. I had my new GoPro rig all set for shooting a timelapse, and the results (at the top of this post) turned out quite well. At fifteen times actual speed, that’s more or less what it looks like to spend 35 minutes working a moderate catch. 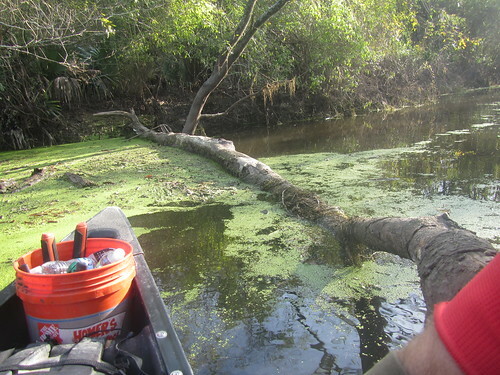 There was a bit of work to do, clearing each issue along the way, but it was at most a moderate day’s work on the bayou. Other than one old floating tree trunk and half of one smallish fallen tree, there wasn’t too much heavy exertion, and the biggest logs were close enough to the end of the bayou to set them free and let them float until next time. Hopefully they’ll float along their merry way, but we’ll be back to help them along if they don’t. It was a great day for a paddle, and it was also a particularly good day for deer sightings. I even had one stay still and just watch me long enough to get several photos (although eventually it spooked). 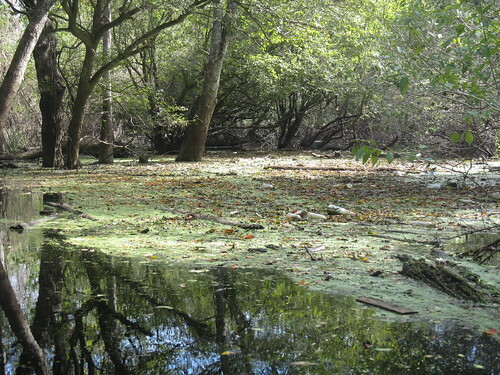 The water was low enough, the current was gentle enough, and the weather was about perfect. How much more can you ask for on a nice fall day on a Louisiana bayou. Looking forward to the next time. It was a great day on the water!!!! Well it must be easier this fall because of all the previous work you’ve put into it!! Great going and thanks for the posts.